Are You In The Section? Welcome to The Section. We are a social media networking app that lets you show the world who you are and share your life experiences through pictures and videos and text. Our goal with the Section is to maintain a highly motivating and inspired community. We want to focus on the most interesting, unique, and inspiring/motivating people around the globe. Too many times we continually see negativity and hate all over social media. The Section is all about straying away from that and pushing positivity! Are you interesting and want to share your life and story with others? Do you like to help people? Do you have a story or experience that can inspire and uplift others? Maybe you would just like to share your everyday experiences with the world...then The Section App is your new home. 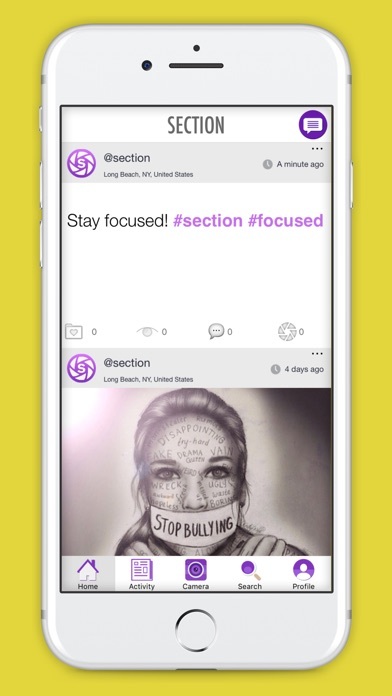 We here at The Section app do our best to stay away from any negativity, any hateful or abusive comments and posts throughout the app. Bullying has seemed to transition to social media nowadays and that's why posting and sharing positive pictures and videos will counteract that. Download our app and join The Section today. Post a text about how you feel today! 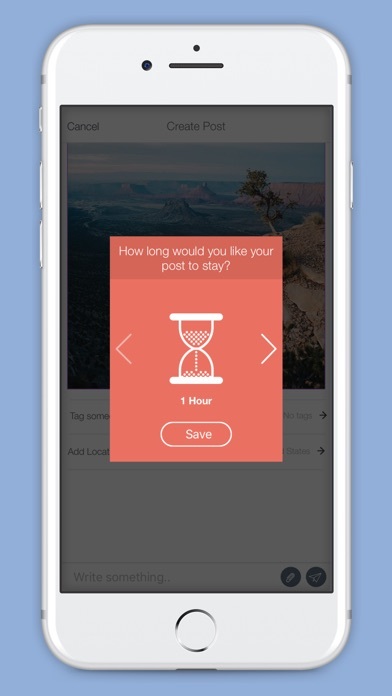 You have the choice to leave that text post up for an hour, 24 hours or lifetime. Share pictures old and new with new friends. Upload a video or record a new one and share it with people in your Section. When you sign up, you must choose 3 Sections that you want to be in. Be the top member in your section. Share and chat with other members in your section, or find people in other sections. You can search by places, my sections, tags, or other sections. Post a video on your timeline for 1 hour, 24 hours, or lifetime. Post pictures, tag places you have been, or tag your friends. Send private messages/videos or pictures to friends or even maybe someone you saw and wanted to say "hello" to. 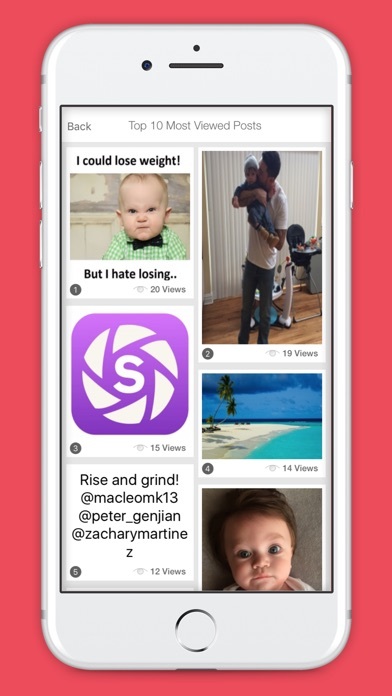 See what pictures/videos got the most views/likes that you or your friends posted. You can look at anyone's page and see their most liked photo of all time/the month/the week, etc. See the most viewed people in each Section as well as on the entire app. We encourage you to follow people, post great content and stay active! This can boost up the amount of views you receive from others as well as gain new friends. -Zoom in feature to zoom in closer to pictures. -Screen shots: See how many screen shots your pictures get. This feature doesn't include who actually screen shots your picture, but it keeps count of the amount of your screen shots on your pictures. Feel free to screen shot others pictures if you see something interesting or unique about their photo. You will get a notification that someone has taken a screenshot of your photo, but it wont say who that person was....it's a mystery. Download the app and create your Section account. Fill out your member details and username. Next, choose your profile picture so the world can see who you are. We also ask for your Instagram account name (optional). We hope to see you on our app and become a part of our new inspired and motivated community.